Prepare to ugly cry at your desk or shed a few slow rolling tears, all because of a horse named Sam. In a holiday ad from Purina created by The Martin Agency, Sam the horse is desperately waiting for someone to come and take him home. All the other horses at the rescue and adoption stable find new owners, but not Sam. After another Christmas comes and goes, the stable owner says to Sam, "Maybe next year" and cuts to an incredibly sad close-up shot of the horse alone in the dark. He's been stuck in a stable for far too long and is looking for the perfect owner. Then one morning, something changes. A little girl comes to visit the stable with her family, and the magic unfolds right before our eyes. Everyone's wish comes true in the end with the old man seeing a horse go to a good home, a little girl finding a new best friend, and Sam getting a new family. 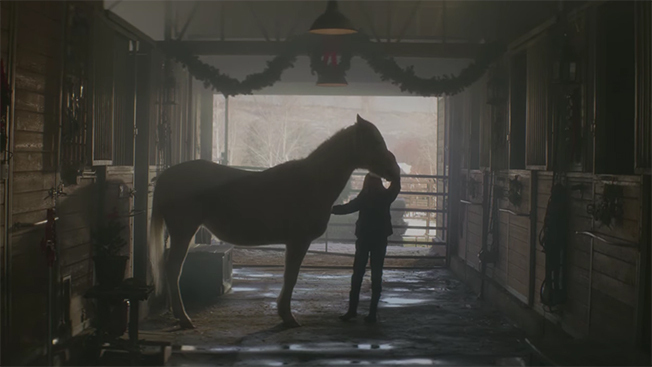 "Purina asked us to tell a holiday story about a horse looking for a home, something emotional, and they needed a final film in just a few weeks," Andy Azula, ecd at The Martin Agency, said. "The client said, 'Make sure you get a close-up of the horse's eyes. They say so much.' He was right." With the latest campaign, Purina wanted to share its belief that there is greatness in every animal, but in order for that greatness to come out, each animal needs a great place to call home and of course great food to keep it healthy and strong.